Turkey burgers can be lower in calories than regular burgers. Although turkey burgers are typically lower in calories than hamburgers, cheese is a calorie-dense food, so turkey burgers with cheese may be higher in calories than you'd expect. One 5 oz turkey burger with cheese contains 475 calories. You should note that this does not include a bun. Nutirstategy's calorie expenditure information explains that it would take about two hours of canoeing to burn off 475 calories. According to the nutrition facts at the Daily Plate, a 5 oz turkey burger with cheese contains 5 g of fat. The United States Department of Agriculture suggests consuming between 20 and 35 percent of your total calories from fat each day. Both turkey and cheese are rich in protein, so turkey burgers with cheese are high protein meals. 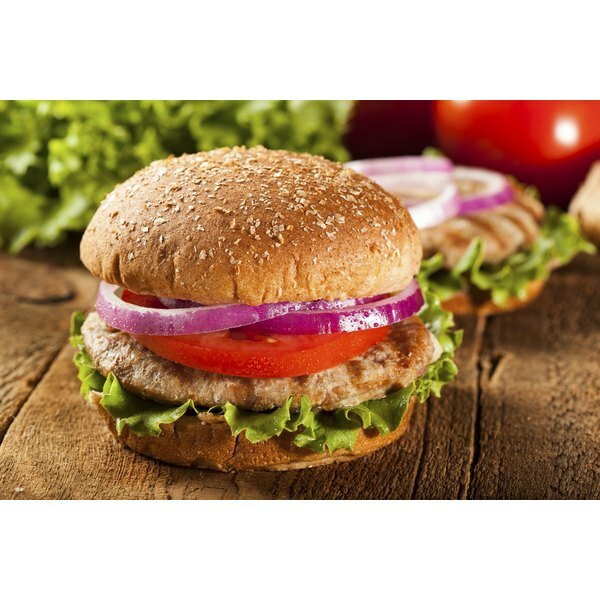 According to the Daily Plate, a 5 oz turkey burger with cheese contains 60 g of protein. Protein helps your body build muscles, and Dr. John Berardi explains that high protein diets may also help you lose weight, as well. The nutrition information at the Daily Plate notes that a 5 oz turkey burger with cheese also contains 15 g of carbohydrates. Carbohydrates are your body's main source of energy.